Traffic was snarled on the Peninsula for several hours Saturday after a tractor-trailer struck a power pole overnight, prompting U.S. Highway 101 to be closed in both directions in Burlingame. The California Highway Patrol, which issued a sig-alert due to the incident, reopened southbound lanes just after 2 p.m.
All Southbound lanes are now open! The scene after southbound Highway 101 was reopened around 2 p.m. Saturday, Aug. 29, 2015 after an overnight closure due to downed power lines. Three northbound lanes were opened to traffic around 3:40 p.m. but the far right lane was left shut to make room for PG&E crews to continue their work, according to the CHP. The CHP originally estimated that north and southbound lanes would be blocked till 5 p.m. However, they tweeted around 1 p.m. that all southbound and some northbound lanes were expected to reopen "within the hour." Ramps on and off Broadway were slated to remain closed, CHP officials said. GOOD NEWS! Per @PGE4Me All Southbound and partial northbound lanes expected to re-open within the hour. Broadway ramps will remain closed. A tractor-trailer struck a power pole around 9:30 p.m. Friday, knocking high-voltage lines down across both northbound and southbound lanes, according to the CHP. Traffic is being diverted off the highway at Anza Boulevard in the northbound direction and at Millbrae Avenue in the southbound direction. Commuters are advised to use Interstate Highway 280 as an alternate route, CHP officials said. 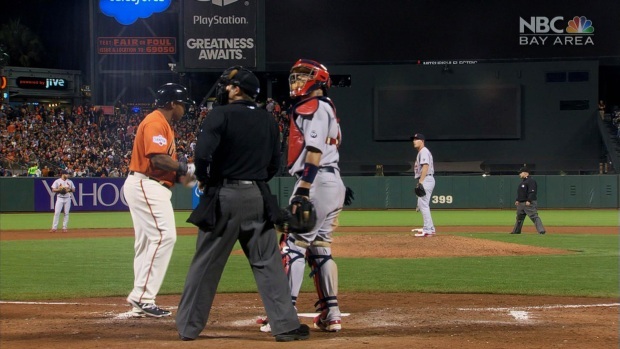 The scoreboard and lights at AT&T Park briefly went out during the Giants-Cardinals game, Friday, Aug. 28, 2015. PG&E confirms a crash on 101 that took out power lines is to blame. The incident may have been responsible for brief power outages from San Francisco down the Peninsula. PG&E, whose crews responded to the scene with special equipment to de-energize the lines, confirmed the flickering lights and scoreboard issues during the Giants-Cardinals game at AT&T Park were related to the crash.